TAMPA, FL—(Marketwired – April 30, 2018) – Advanzeon Solutions, Inc. (OTCBB: CHCR) (“Advanzeon” or the “Company”) announced today that it has expanded its management team by electing Dr. Stephen Kreitzer, currently serving as the Company's Medical Director, to the Company's Board of Directors; electing Dr. Arnold Finestone, a current member of the Company's Board of Directors and longstanding Chairman of its Audit Committee, to serve as the Company's Chief Financial Officer; and, electing Mr. Cesar Vallarta to the position of Senior Vice President of Sales and Marketing. The Company also announced the expansion of its presence in California by bringing its total number of California sales and marketing representatives to three. Dr. Stephen Kreitzer has long been serving as the Company's Medical Director and was responsible for the early formation and expansion of the Company's Medical Advisory Board. He was also responsible for positioning the Company as a premier sleep apnea diagnosis and treatment company. Practicing medicine in Tampa for over thirty years, Dr. Kreitzer currently serves as the Medical Director of the Sleep Laboratory at Memorial Hospital of Tampa, as well as the Chief of Pulmonary Medicine. He also chairs the Medical Ethics Committee at Memorial Hospital; previously served on the Board of Censors of the Hillsborough County Medical Association; served as a Major in the United States Air Force, and has conducted over 100 clinical FDA–approved trials. Dr. Kreitzer has authored numerous articles in his field of expertise, Pulmonology, and was recently voted “Top Doctor” by his peers in the Tampa Bay area for both Sleep Medicine and Pulmonary Medicine. Dr. Arnold Finestone joined the Company in early 2009, serving initially as Chairman of the Company's Board of Directors and continuing thereafter as a member of the Board throughout. He also chairs the Company's Audit Committee in addition to serving as Special Consultant to the Company on a number of business matters. Dr. Finestone has an exemplary 50+ year history in various business operations, having guided each of the companies he has worked in achieving remarkable successes. Dr. Finestone received his Ph.D. from Polytechnic Institute of Brooklyn in 1955. From 1957 to 1970, Dr. Finestone was Vice President and Director of Planning, Development and Marketing for Foster Grant, Inc., building that business from a $12 million company to a $124 million company. In 1970, Dr. Finestone joined Dart Industries. He was Dart's executive vice president in charge of the chemical and plastic group, a $2.8 billion group, at that time. In 1980, Dart Industries merged with Kraft Foods and had grown to an $8 billion business. Shortly after, the petrochemical business part was sold by Dart and Kraft. In 1985, Dr. Finestone retired and started a business in the production of biotech chemicals becoming a large producer of vaccines, specifically in the flu area. For the next few decades, Dr. Finestone was engaged in several businesses and then joined the Company's Board in 2009. Mr. Cesar Vallarta has been a practicing attorney in government and private practice, as well as a businessman, in both the United States and Mexico, with over 25 years of combined legal, scientific and business experience. His legal practice focused primarily on international law; contract litigation; and, prison reform, primarily in the medical field for the government of Mexico. Mr. Vallarta's private business activities have focused on international trade under the rules and regulations of NAFTA (North American Free Trade Agreement); medical rehabilitation centers; and, marketing. He currently serves as the CEO of an international trade group specializing in advising international companies in matters concerning international law, compliance and revenue generation. Established in 1969, Advanzeon, through its subsidiaries, owns and operates the nation's most complete sleep apnea program known as SleepMaster Solutionsâ¢ (the “Program”). Headquartered in Tampa, Florida, the Company's Program is available in all fifty states, Washington D.C. and Puerto Rico. The Program focuses on personalized attention, flexibility, a commitment to high–quality services and innovative approaches that address both the specific needs of clients and changing healthcare industry demands. For more information, visit our website at www.advanzeon.com. PLANO, TX—(Marketwired – April 30, 2018) – Torchlight Energy Resources, Inc. (NASDAQ: TRCH) (“Torchlight” or the “Company”), today announced that stimulation of the Penn formation has been successfully completed on the University Founders A25 #1H horizontal well in the Orogrande Project. A total of six stages were fracture stimulated using 1.6MM pounds of sand at 60 bpm. Average stage breakdown pressure was 4,500 psi. The stage plugs have now been drilled and the flow testing phase has begun. This news release contains forward–looking statements within the meaning of Section 27A of the Securities Act of 1933 and Section 21E of the Securities Exchange Act of 1934. These statements involve risks and uncertainties that could cause actual results to differ materially from those described in such statements. Such forward–looking statements involve known and unknown risks and uncertainties, including risks associated with the Company's ability to obtain additional capital in the future to fund planned expansion, the demand for oil and natural gas, general economic factors, competition in the industry and other factors that could cause actual results to be materially different from those described herein as anticipated, believed, estimated or expected. The Company is under no obligation (and expressly disclaims any such obligation) to update or alter its forward–looking statements whether as a result of new information, future events or otherwise. Designed as a modern, 21st–century turboprop, the Q400 aircraft is the most recent development in the Q Series family of aircraft. It provides unmatched performance, operational flexibility and passenger comfort. In addition to the standard single–class configuration, Q400 aircraft are available with an optional dual–class interior for enhanced passenger comfort; in an optional extra–capacity configuration offering up to 90 seats for higher–density markets; and in a cargo–passenger combi configuration. 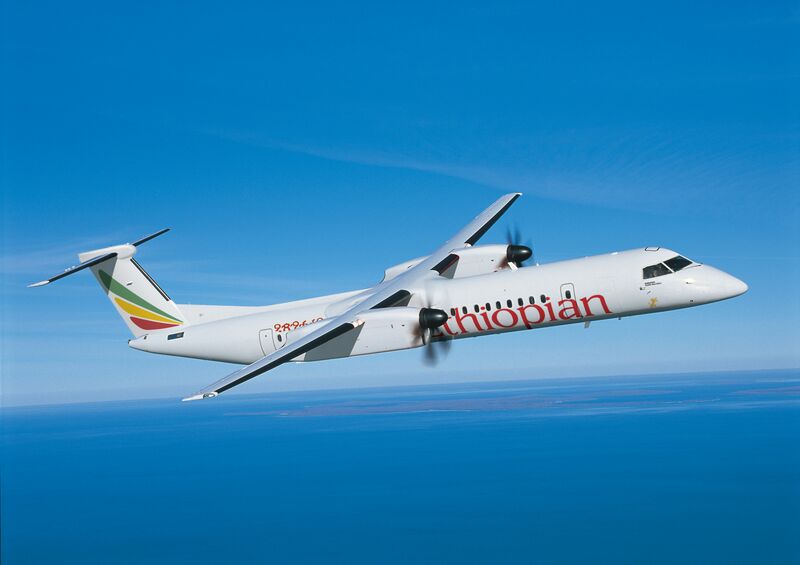 Images of the Q400 aircraft in the Ethiopian Airlines livery are posted with this press release at www.bombardier.com. TAMPA, FL—(Marketwired – April 27, 2018) – Advanzeon Solutions, Inc. (OTCBB: CHCR) (“Advanzeon or the “Company”) announced today that it anticipates filing its Annual Report on Form 10–K (“10–K”) for the fiscal years ending 2013 and 2014 by May 9, 2018. Oryzon Genomics (ISIN Code: ES0167733015) (MAD: ORY), a public clinical–stage biopharmaceutical company leveraging epigenetics to develop therapies in diseases with strong unmet medical need, has announced today that Executive Directors of the company will present at several international reputed conferences in May. Dr. Carlos Buesa, Oryzon's CEO, will present the recent progresses of ORY–2001 at 13th Annual Neurotech Investing & Partnering Conference to be held at the Renaissance Waterfront Hotel, Boston, MA USA. The Company presentation will take place in the panel “Treatments for Alzheimer's and Cognitive Disorders” on Tuesday, May 1, 2018 at 10:40 am. The panel will be moderated by Dr. Michael Gold, Vice President, Development Neurosciences, AbbVie. The company has recently reported that ORY–2001 has been approved to start its second Phase IIa clinical trial, this time in mild to moderate Alzheimer's patients. ORY–2001 exerts a holistic action in the different alterations seen in patients with AD and other neurodegenerative disorders. Different experiments suggest that ORY–2001 may act as a disease modifying drug. In AD patients and other neurodegenerative disorders, cognitive deterioration is often accompanied by episodes of agitation, aggression, psychosis, apathy and depression. In preclinical studies, ORY–2001 not only restores memory but reduces the exacerbated aggressiveness of SAMP8 mice, a model for accelerated aging and Alzheimer's disease, to normal levels and also reduces social avoidance in rat models maintained in isolation. The drug has been tested in 6 month rat and 9 month dog GLP toxicology studies to enable long term Phase II studies. The safety and tolerability of ORY–2001 has been studied in a Phase I clinical trial with 106 young and elderly healthy volunteers, confirmed LSD1 target engagement and ORY–2001 brain penetration, and allowed to establish the doses for the Phase II dose finding studies in patients. The company recently started a Phase IIa with ORY–2001 in patients with multiple sclerosis which is currently progressing after the FPI was enrolled in January. ORY–2001 is an orally administered, brain penetrant drug that selectively inhibits LSD1 and MAOB. The molecule acts on several levels, reduces cognitive impairment, memory loss and neuroinflammation, and at the same time exerts neuroprotective effects. In several preclinical models of MS, ORY–2001 exhibits strong and durable efficacy. LSD1 is an epigenetic modulator, which regulates histone methylation and modulates gene expression patterns. Epigenetic approaches to modify the progression of various neurodegenerative diseases, which focus on the production of changes in gene expression patterns in brain cells, have generated interest in the pharmaceutical industry. أعلنت شركة بومباردييه للطائرات التجارية اليوم أنها أبرمت اتفاقية مع الخطوط الجوية الإثيوبية بطلب مؤكد لشراء 10 طائرات Q400 جديدة. يتضمن الطلب أيضًا حقوق شراء خمس طائرات Q400 إضافية. تبلغ قيمة الطلب المؤكد حوالي 332 مليون دولار أمريكي بناءً على قائمة أسعار طائرات Q400. وصرح فريد كرومر -رئيس شركة بومباردييه للطائرات التجارية- بقوله "تستمر محركات بومباردييه المروحية التوربينية في تزويد مشغلينا بأداء لا يُضاهى، ونحن فخورون بأن الناقل الجوي الوطني الإثيوبي يُقر من جديد بالقيمة الهائلة لطائراتنا من خلال زيادة عدد أسطوله من طائرات Q400". "الجدير بالملاحظة هو تزايد اتجاه السوق نحو المحركات المروحية التوربينية الأكبر حجمًا بأدائها العالي، ويُعد هذا الطلب المُكرر للمرة الخامسة مثالًا رائعًا لقصة النجاح للمحركات المروحية التوربينية Q400 والقيمة التي تحققها للعملاء في جميع أنحاء العالم." طائرة Q400 التي صُممت لتكون طائرة توربينية حديثة من القرن الحادي والعشرين هي أحدث تطوير لعائلة طائرات Q Series. فهي تقدم أداءً لا يُضاهى ومرونة تشغيلية وراحة للركاب. وبالإضافة إلى تكوينها القياسي من فئة واحدة، تتوفر طائرات Q400 مع تقسيم داخلي اختياري ثنائي الفئة لتعزيز راحة الركاب. وهو تكوين اختياري يوفر سعة إضافية يصل قوامها إلى 90 مقعدًا في قطاعات الأسواق عالية الكثافة؛ وفي تكوين يجمع بين الركاب والبضائع. تعتبر بومباردييه التي تُوظف أكثر من 69,500 شخص في أربعة قطاعات أعمال، شركة رائدة عالمياً في صناعة النقل، حيث تقوم بإنتاج طائرات وقطارات مبتكرة ومتطورة للغاية. وتوفر منتجاتنا وخدماتنا خبرات نقل عالمية المستوى تضع معايير جديدة لراحة الركاب وكفاءة الطاقة والموثوقية والسلامة. يقع مقر شركة بومباردييه في مونتريال بكندا، وتمتلك مواقع إنتاجية وهندسية في 28 دولة عبر قطاعات النقل، وطائرات الأعمال، والطائرات التجارية، وهياكل الطائرات والخدمات الهندسية. ويتم تداول أسهم بومباردييه في بورصة تورنتو (BBD). وقد سجلت بومباردييه في السنة المالية المنتهية في 31 ديسمبر 2017، إيرادات بلغت 16,2 مليار دولار أمريكي. الأخبار والمعلومات متوفرة على الموقع الإلكتروني bombardier.com أو يمكنك متابعتنا على تويتر @Bombardier. تُنشر صور تسليم طائرات Q400 إلى الخطوط الجوية الإثيوبية مع هذا البيان الصحفي في www.bombardier.com. تابع حساب @BBD_Aircraft على تويتر للحصول على أحدث الأخبار والتحديثات من شركة بومباردييه للطائرات التجارية. لتلقي نشراتنا الصحفية، يرجى زيارة قسم RSS Feed في الموقع الإلكتروني لشركة بومباردييه. تعتبر Bombardier و Q400 و Q Series و The Evolution of Mobility علامات تجارية لشركة Bombardier Inc.، أو شركاتها التابعة.